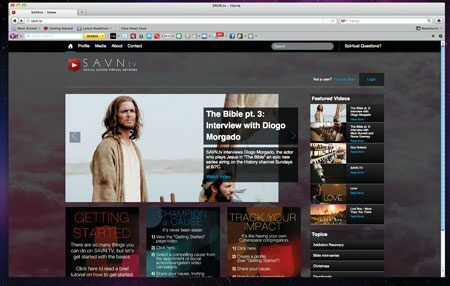 Media, including History Channel’s “The Bible” mini-series and The Salvation Army’s SAVN.TV, expand the church’s reach online. Mega-TV producer (think Survivor, The Voice, and The Apprentice) Mark Burnett and wife Roma Downey’s (who played the angel Monica on Touched by an Angel) new TV mini-series “The Bible” broke viewership records week after week as it aired on the History Channel in March, exploring five sections of Scripture in 10 hours. Its audience didn’t wane, growing as much as 11 percent a week, according to Grace Hill Media, the marketing firm responsible for promoting the series. Before the series’ debut, Guy Noland, executive producer at SAVN.TV, interviewed Mark Burnett and Roma Downey at their home in Malibu. SAVN.TV—The Salvation Army’s Vision Network—launched in 2011, but the leadership team considers it a “work in progress” as “Version II” is now on the drawing boards of designers and programmers. 1) It’s popular because it’s agenda-free. It’s not the normal, more controversial approach of “Jesus: Did He Secretly Marry Mary Magdalene?” Or “Jesus: Was He Gay?” It’s just the story of the Bible with no slant and no agenda. 2) It’s popular because it’s unifying. More than 40 scholars, theologians and pastors from the entire spectrum of Christianity advised the production. It was designed to appeal to the wide range of Christians, not divide the audience. 3) It’s popular because not only does each episode have a compelling story arc, but the entire series tells the meta-narrative of God and how he deals with humanity. This is similar to the Bible itself, where each book has its own theme and story, and yet all fit into a far bigger story of how God has revealed himself to his creation. Guy Noland of SAVN.TV interviews Mark Burnett and Roma Downey. 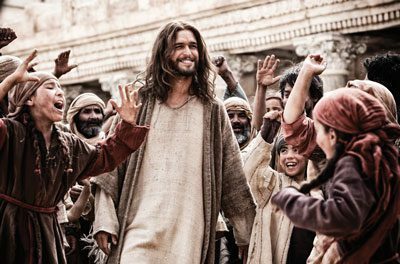 Left: Diogo Morgado as Jesus in the miniseries The Bible. But as media producers and creators, both Burnett and Noland know we live in a culture that doesn’t understand the impact of the Bible on our history. The truth is, the Bible’s influence on literature, art, music, education, and so much more is immeasurable, but every day, we seem to drift farther and farther away from our biblical moorings. We see the results of that loss in our schools, our communities and our leadership. That’s why SAVN.TV worked to spread the news about the series throughout the digital world and will also share the story of Paramount Pictures’ upcoming motion picture, “Noah,” starring Russell Crowe. Knaggs is determined to expand Booth’s vision, culturally, geographically and digitally into the 21st century. “[SAVN.TV] presents a pace-setting opportunity for The Salvation Army to be on the virtual missional and evangelical cutting edge,” Knaggs said. A unique combination of a video-driven website and social action network, SAVN.TV empowers users to connect to and present causes, share online tools for giving, and support and participate in social services across the world. As the world now shifts to mobile access, SAVN.TV plans to launch a mobile app and focus on creating short films that help people share the message of Jesus with friends, coworkers and family. See more about “The Bible” at history.com/shows/the-bible and the SAVN.TV interview with its producers at savn.tv/campaign/view/554.